Drymonia is one of the most morphologically variable and largest genera (100+ species) within the neotropical members of the Gesneriaceae; it grows throughout much of tropical America, and its center of diversity is in the mountain forests of Northern South America. 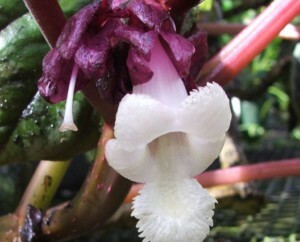 They largest number of species of Drymonia is found at mid-elevation (500-1500 m) in very humid forests in the western slopes of the Tropical Andes. The species of this variable genus can grow as herbs or shrubs, and as terrestrial, epiphytes, or climbers. The stems are often square and the pair of leaves of the same node usually have the same size. The largest variation is found in the flowers, which are often large and attractive, adapted to different modes of pollination (bees and hummingbirds). Fruits are also very variable and colorful, always fleshy but with different ways to open at maturity. Indoor cultivation is sometimes difficult with the Drymonias, as they can become large and ungainly. However, judicious pruning can result in attractive plants. The leaves are often large and decorative, in some species the upper surface is dark green with light green around the veins, or with white spots, and the lower surface is maroon, which make them very attractive for cultivation. Besides the large and beautiful flowers, colorful bracts are sometimes present, which can be persistent and lend a continuing effect of bloom to a plant. Most of the Drymonias bloom on old wood, so cutting back a plant will not interfere with blooming, and may result in the blooms becoming more visible than would otherwise have been the case.